Welcome to Explore the South West Coast Path. This guide will take you through some walks on the South West Coast Path, Britain's longest footpath at 630 miles long. I havn't yet covered the whole path in this guide, but it is something I will add to over time. Click the image below for the section you are interested in. New Combwich to Pawlett. This page has information on changes and updates to this web site. This page has news on any path changes or diversions. 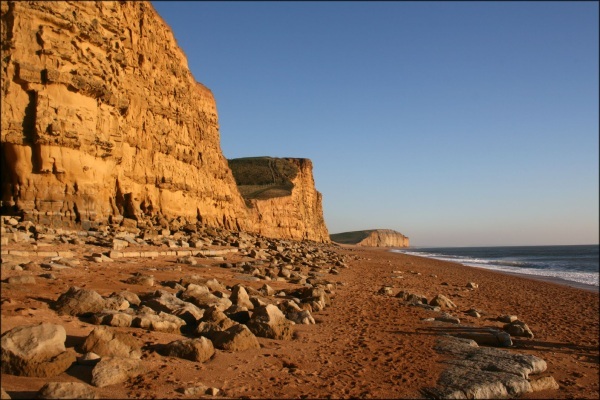 This page lists beaches on the South West Coast path that hold the prestigious Blue Flag award along with a link to the walk(s) that pass them. The Somerset part of the costal path takes in one of the most beautiful landscapes in Britain, the Exmoor National Park. The very rugged coast has some steep climbs but rewards you with some stunning views, waterfalls and lovely wooded sections. The majority of beaches on this part of the coast path are rocky. The North Devon section of the coast path passes through the remote coast of North Exmoor, passing through Combe Martin and the popular resort of Illfracombe. There are many excellent beaches on this part of the coast, as well as the pretty village of Clovelly and the remote coast near Hartland. The North Cornwall section of the path has wonderful beaches, Atlantic Breakers and some rugged and beautiful scenery. From the very north of the coast near Bude, past the famous Tintagel Castle, the camel estuary near Padstow, the popular resorts of Newquay and St. Ives to Lands End, the very south west corner of England. The South Cornwall section of the path passes through several pretty fishing villages. It also takes in the spectacular and remote Lizard peninsula which has some excellent beaches. To the west, is St Michael's Mount at Marazion. The South Devon section is a varied part of the path. The white chalk cliffs of Beer, rapidly change to high red cliffs leading into Torbay and the English Riveria, one of Britains best known resorts. Further west, the South Hams offer some of the best beaches in Devon. This section takes you through some remote areas of the path as well as the commercial centres of Plymouth and Torquay. The South Dorset has a massive variety of costal scenery, and is probably the most photographed part of the path. From the flat sands at Studland, past the famous old Harry Rocks and to probably the best part of this section of the coast, Lulworth Cove and Durdle door. This section of the path goes through the popular resorts of Swanage, Weymouth and Lyme Regis, and has been designated a World heritage site. Although not part of the South West Coast path, the Isles of Scilly are a beautiful archipelago of islands. Each of the inhabited islands has a coastal footpath and these offer some stunning coastal walks. The islands have a very varied coastline with a mixture of rocky cliffs and rocky outcrops mixed with wide sweeping bays of white sands backed by palm trees. These islands are a real paradise and easily reached from main land Cornwall. This part of the website descirbes the coastal walks round each. Although not part of the South West Coast path the Channel Islands are crown dependencies whose closest British coastline is that of South West England and they are easily reached from the South West, with ferry connections from Poole and Weymouth and flights from Exeter and Bournemouth (as well as other airports nationwide). These rocky islands are a fascinating mix of Britain and France, with the Queen their head of state, English being the native language (but French widely spoken). Many street names are in French but the islands use the pound (and issue their own notes and coins) and have their own government. Moor importantly there are coast paths around the islands with a new long-distance footpath, the Channel Islands Way, taking in the coast line of the islands. These pages cover the walks around the coast of these beautiful islands. You may not even realise that Gloucestershire has a coast line at all, but the coast of Gloucestershire covers the area north of Bristol to the Severn Bridge until Wales is reached. Being beside the mighty Severn, it is a coast of mud flats and marshes rather than cliffs and beaches, but still one that has a lot of interest. Transport links dominate, with the two road bridges and the unseen Severn Tunnel and if you walk the coast you will walk across the original Severn bridge, offering a high-level view over the swirling waters of the Severn far below. The coast of Somerset offers tremendous variety. Much of the coast of North Somerset is on the Somerset Levels and hence flat, but mixed in with some large hills and headlands, such as Brean Down and Middle Hope that extend from the Quantock Hills. It is dominated by numerous rivers and drainage channels. Heading further south the coast soon becomes far more rugged as it crosses first the Quantock Hills and then the hills of Exmoor, one of Britain's most beautiful and least visited National Parks.